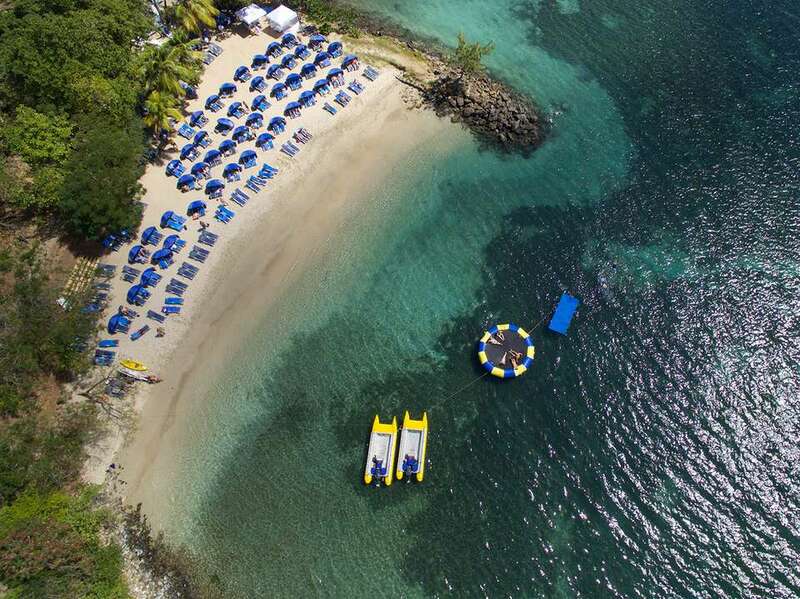 Every beach on the island of St. Lucia, including those that are part of the top resorts, is open to the public. The beaches on the western side of the island front the tranquil turquoise waters of the Caribbean Sea and are favored for swimming and water sports, while the wild but beautiful eastern side churns with the more turbulent waters of the Atlantic Ocean, making it great for surfers and those who like the watch the waves. Although scenic to explore by horseback or jeep, the western beaches are not considered safe for casual swimming. For the most part, St. Lucian beaches are relatively short, but with five miles of white sand on Rodney Bay, Reduit is the place for a long stroll by the shore and a swim in calm waters. Visitors like this beach because its close to the restaurants and shops of Rodney Bay. For the more adventurous, you can try snorkeling, windsurfing, or waterskiing. One of the most popular beaches on the island, Reduit is fronted by the Rex St. Lucian, Papillon, and the Royal St. Lucian hotels. There are restaurants and vendors renting water-sports equipment and lounge chairs. Families enjoy the Splash Island Water Park with floating inflatable slides, ramps, and obstacles. The white sand, crystal-clear water, and stunning setting between the twin Gros and Petit Piton volcanic peaks make this beach south of Soufrière a favorite spot for sunning. Snorkelers and scuba divers come for the adventures to be had at the 1,800-foot drop-off at the base of the Pitons. The Sugar Beach resort, formerly Jalousie Plantation, is located here. The resort takes up most of the beach but there is part of it reserved for the public with separate lounging chairs. With a sharp dropoff, coral reef, and sea walls, this beach affords snorkelers and divers many opportunities for viewing the vividly colored ocean life without ferrying out to deeper waters by boat. The natural black sand marks the volcanic origins of the island. High-end guests flock here daily from the resort named for the beach, Anse Chastanet. On the north side of the beach, there is a walking path that you can take to Anse Mamin beach which is smaller and quieter — a great place for a picnic. Accessible only by foot due to its rocky shores and secluded location, Anse Louvert is the perfect spot for adventurers looking for oceanfront privacy and a bit of fun getting there. This beach may or may not be accessible by car, as sometimes the roads are impassible. It is best to check with locals on the way to find out the road situation. Bring your own food and water, though, because there are no beach bars, bathrooms, or facilities in this remote setting. Quiet and uncrowded, this beach on the north end of the island is the place to combine sunning and swimming with a visit to a mini-museum. From there, you can climb to a vantage point to see the historic Fort Rodney ruins and views of distant Martinique. Pigeon Island is a national landmark, which covers the 44-acre island reserve. The island was originally surrounded by water but was joined to the mainland by a man-made causeway in 1972. Two eateries stand ready to fill visitors' needs, and there's a rum bar in the underground tunnel beneath the fort. Pigeon Island also serves as the venue for the world-famous St. Lucia Jazz Festival each spring. Soon to become part of a new national park, this mile-long stretch of beach north of Dennery is set against a backdrop of cliffs in an area that was once a plantation. Grand Anse, somewhat remote, offers a chance to get away from the crowds and walk the beach. Now, visitors come for Turtle Watch, where they can see the natural wonder of endangered leatherbacks, the largest of sea turtles, heaving themselves out of the water and onto the beach to lay their eggs. Located on the western coast of St. Lucia, Marigot Bay is the site of a plethora of small beaches. With its abundance of boats and catamarans in port, its white sandy beaches, and its surrounding border of island trees, Marigot Bay is picturesque — so much so that it is often used for aerial shots in Hollywood films. Though the beaches, including La Choc Beach, Anse Couchon, and Vigie Beach, may be crowded at times, ask locals for the best beaches to visit in the area and you should be able to find one with some amount of seclusion.